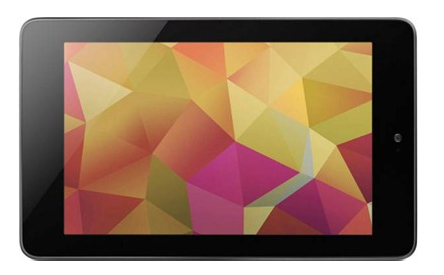 Nexus 7 is a Google tablet, manufactured in collaboration with Asus and Asus,the Taiwanese company has released the 32GB variant of the Nexus 7 Wi-Fi tablet for the price of Rs. 18,999 earlier this month and had also released a 3G variant for Rs. 21,999. But the device with 32GB is made available on India Google Play Store for Rs. 18,999 now and the surprising thing is the Play store is having the option for Google Nexus 7 32GB Wi-Fi only tablet where as there is no sign of 3G variant of this device on Play store as of now. 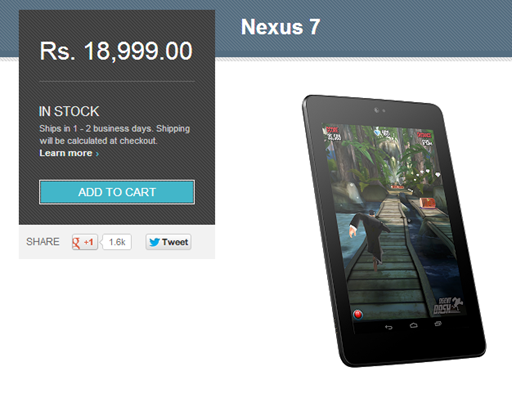 Nexus 7 was unveiled in June 2012 and went on sale from mid-July. At the time of its launch, the 8GB Wi-Fi version of Nexus 7 was made available for $199. It was then replaced by a 16GB version at the same price and month after launching the 16GB variant of the Nexus 7 tablet on Google Play in India, Google has now launched the 32GB variant. The tablet runs Android Jelly Bean (version 4.1) and is powered by the Nvidia Tegra 3 1.3 GHz quad-core processor and comes with a 7-inch IPS display screen as the name suggest with a resolution of 1280×800 pixels and pixel density of 216 ppi. The tablet has 1GB of RAM, a 1.2 megapixel front camera and a 4325 mAh battery and also includes NFC functionality. It is interesting to note that while a much-awaited Nexus device is officially being released in India and Google has put up the Wi-Fi-only variant of it for sale on the site. So the question here we have is that if only this variant will be available from play store or this is because of any cache issue and we can see the 3G variant coming to the google play store soon. At only 12 oz, Nexus 7 is the lightest 7” tablet on the market today, but boasts all the premium features you need on the go, including a compact but crystal clear HD display, 1.2 megapixel camera. The tablet is great for reading and playing games as it promises the LAG free operating system for the users. From the day the device was launched it is giving a good fight to the most popular Apple device iPad-mini because for iPad-mini with WiFi and 3G one has to pay approx 30,000 INR but now the Asus Google Nexus 7 offers the same in Rs.18990 for wi-fi and Rs.21,000 INR for 3G variant. These tabs will come with the latest version of Android i.e 4.2 Jellybean (bug-fixed version) and covered under the warranty of 1year by Asus.